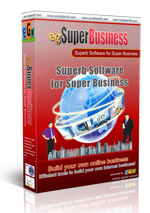 EGN Software invites you to join in affiliate & Reseller program which is good opportunity to gain additional income. Get commission up to 10% - 20% for every sales that you gain from your reseller or affiliate link. As our partner, you only need to sell! If your customers have questions or need help, sent them to us. We will fully help your customers. If you have website or blog or places to sell, Please gather as our partner. After the registration, please wait for the activation of your account. Then after your account is activated, please login to member area to see your affiliate tools and commission report.